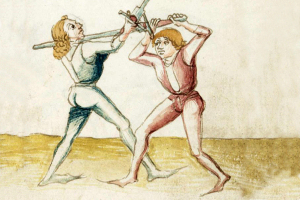 In the 14th century, a mysterious fighting Master (fechtmeister) known as Johannes Liechtenauer codified a system of fighting with the dagger (dolch), long knife (messer), longsword (langschwert), spear (spiess) along with wrestling (ringen) that was to endure throughout the territories of the Holy Roman Empire for over two centuries. 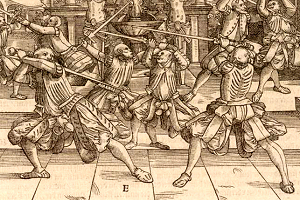 Liechtenauer’s art comprised principles and techniques for fighting on horseback (roßfechten), as well as on foot in armour (harnischfechten) and unarmoured (blossfechten). Later Masters within Liechtenauer’s tradition would provide detailed commentaries (glossa) on his original cryptic verses and in some cases his disciples would go on to instruct some of the leading lords and princes of Germany in the art of knightly and judicial combat. Notable examples include Sigmund Ringeck, Master of Arms for Albrecht, Count Palatine of the Rhine and Duke of Bavaria and Paulus Kal, in the service of Duke Ludwig IX of Bavaria, both during the 15th century. Liechtenauer’s influence over the art of combat (kunst des fechtens) within the empire was so great it is logical to speak of a characteristically German school of swordsmanship based on his teachings. Indeed, it became almost standard practice for any self-respecting fencing Master within German speaking territory to claim authority by demonstrating standing within Liechtenauer’s tradition (whether such links were evident or not). Our first known source for Liechtenauer’s art is a hausbuch (a medieval version of a miscellanea) called Cod.HS.3227a dating from the late 14th century. The complete text is a colourful and fascinating collection of diverse subjects including fireworks, alchemy, recipes, astrology and magic. Although a priest by the name of Hanko Döbringer is sometimes cited as the author (and the text therefore referred to as Döbringer for convenience) the true authorship of the combat section remains a mystery (a common situation with later texts as well). Döbringer details a sophisticated, martially effective system of combat based on continuous yet efficient movement, seizure of and control over initiative and relentless but carefully calculated and nuanced offence and defence. 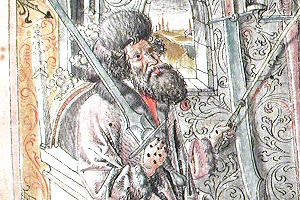 Corresponding with similar developments across Europe, the 15th century in particular witnessed a flowering of German fighting literature, with the production of many fight books (fechtbücher) including some attributed to Masters such as Sigmund Ringeck, Peter von Danzig, Paulus Kal, Johannes Lecküchner and Peter Falkner. The audience for most of these fechtbücher were the knights, nobles and princes of the empire, who used the skills in wars, tournaments and in the ritualistic judicial combats and duels of the period. The once knightly art was by the 16th century also being practiced extensively by citizens of Germany’s leading cities. 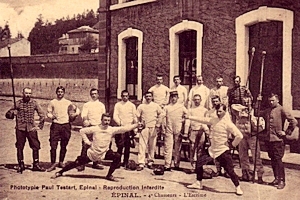 Although much of the practice was apparently for competition and fitness as much as self defence, the intensity of friendly fencing matches can be seen in victory conditions such as the red flower (rot blume), a bleeding head wound inflicted on the opponent with a cutting stroke to win a bout. 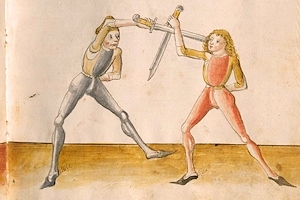 The longsword remained the main pedagogical and most esteemed weapon within Germany, although it was being somewhat transformed into a civilian weapon for fencing in the fighting schools (fechtschülen) and guilds of the day. 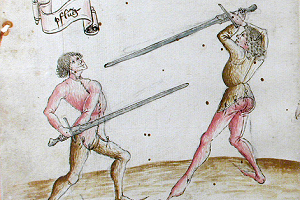 Wrestling, dagger, dussack, rapier, staff and spear were important disciplines with direct martial application and, along with the longsword, feature prominently in the highly detailed and beautifully illustrated works of Paulus Hector Mair (a civil servant who was hanged in older age for embezzling funds from the Augsburg treasury) and Joachim Meyer (a cutler and fencer from Strasbourg who later became Master of Arms for the Duke of Schwerin). 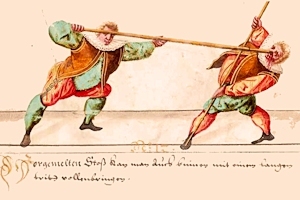 Fencing remained a popular pursuit both for civilians and for soldiers and officers of European militaries until the 20th century, although the popularity of the older, traditional weapons of the fechtschülen within Germany unfortunately declined from the 17th century onward, despite the best efforts of authors including Jakob Sutor and Theodor Verolinus. The practice of arms did not stagnate however, and older practices were subsumed into the highly scientific practice with the preferred civilian and military weapons of the day, including the backsword, heavy sabre and a variety of staff weapons. 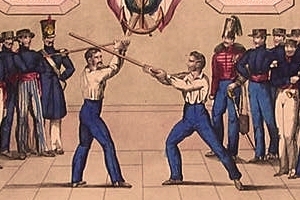 Amongst civilians, weapons such as canes, smallswords, duelling swords, duelling sabres and double handed long sticks were popular in fencing salles (schools) of Europe. The practice of arms was maintained alongside the sophisticated practice of unarmed skills such as wrestling, boxing, purring and a growing emphasis on calisthenics and physical culture. 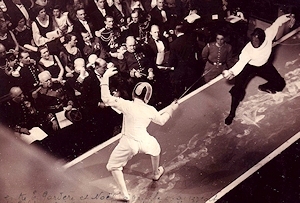 Even later, as the 19th century rolled over into the 20th, the modern foil, epee and sabre still used today in modern sport fencing finally began to eclipse the last truly martial fencing practices of old Europe. Traditional military weapons such as backswords, heavy sabres and staves that were heavier than the modern sport weapons began to be unfairly looked down upon by sporting practitioners studying fencing for very different purposes to their civilian and military predecessors. Our activity, known today as historical fencing to distinguish it from the sport of modern fencing with the modern, ultra-light three sporting weapons, is all about the revival of the almost forgotten art of fencing with the older and more martial weapons. For more information or to enquire about coming along to a class, please contact us at collegiuminarmis (at) gmail.com or check out our Facebook page.